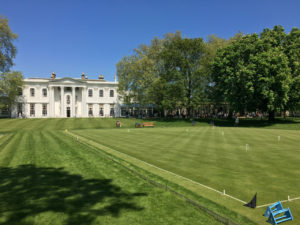 Daniel Gott and Andrew Willis both had very successful weekends playing at Hurlingham over the May Bank Holiday weekend. In only his second Croquet Association tournament, Daniel was runner-up in Block B against players with handicaps ranging from 0 to 2. He finished with eight wins from nine matches, winning many matches by a large margin but unfortunately lost the key clash against the eventual block winner Mark Van Loon from Oxford. Daniel completed two triple peels during the tournament and also achieved a handicap reduction from 0 to -0.5. Andrew played in Block A against players with handicaps ranging from -0.5 to -2. He finished with six wins from eight matches, coming third in the block, which was a significant achievement given that he was typically playing against stronger opposition on paper. In a match that culminated in a dramatic finishing turn, he was also the only player to beat the eventual winner Danny Johnston from Ireland.